If you’re filing for an innocent spouse relief for the first time, you need to do it correctly. It will be very difficult for you to re-apply for the specific years you requested if the first application was denied. You need to file quickly after figuring out the tax debt that should have been charged to your spouse. Before filing, you need to make sure that you have met the requirements of one of the types of spouse relief. The filing process is almost the same for all types of spouse relief. However, the difference only lies on the answers and information you give about your situation. You must check all the requirements for each type of relief and make sure you understand what those requirements are intended for before filling out the forms. Keep in mind that these forms will ask you a lot of questions so you can meet the requirements. 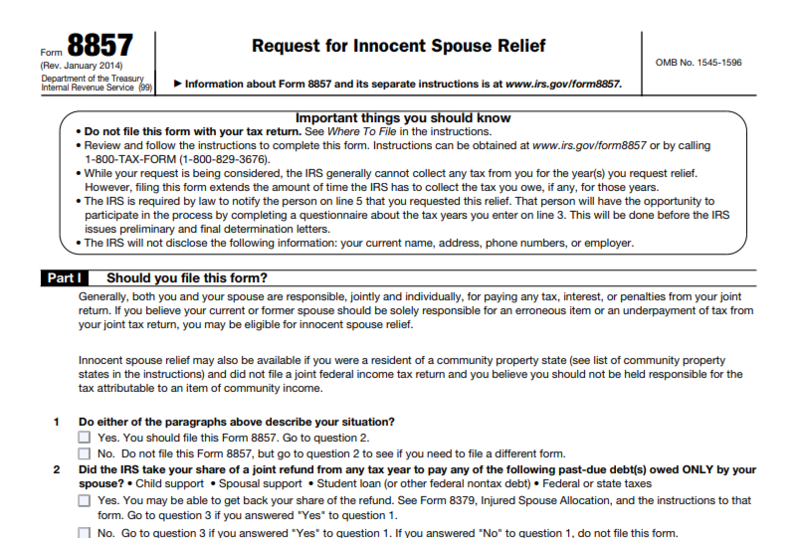 This is a seven-page form used to required to file for innocent spouse relief. In fact, you’ll find yourself bombarded with questions about your situation. This form will also help the IRS figure out how you meet the requirements. Some of the information the IRS will be interested to know are your educational background and professional experience. Those pieces of information will help them assess if the reason is valid enough for you to go wrong with the tax filing. You will have to show additional documents to back up your claims. Just like any records, you need to provide accurate information and be very careful in filling out the form. Any incorrect information may trigger the IRS to reject your request. In general, you need to accomplish Form 8857 not later than 2 years after the IRS conducts its collection activity — except the equitable relief. Your income tax return was used by the IRS to compensate for the joint tax return liability. The IRS sent you a letter that you can file Form 8857. The IRS filed a claim in court wherein you were a party or a court proceeding that included your property. It may also involve filing a proof of claim in a bankruptcy proceeding. You received the following letters: 11, 1058, or another section 6330 notice. 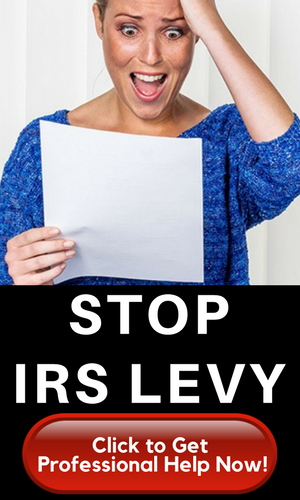 These letters will inform you about the intent to levy by the IRS and remind you about your right to a collection due process (CDP) hearing. You will be required to create a letter if you were abused by your former or current spouse. Even if it’s not required, the letter will help you prove your claim. Some parts of Form 8857 won’t need a lot of explanations. But this letter will help you explain thoroughly why should the IRS qualify you for the Innocent Spouse relief. To get the IRS’s approval, you must attach documents as evidence to back up your claims. For instance, those that are victims of abuse may include police reports, clinical procedures, and doctor’s notes. How to Mail the Documents for the Request for Innocent Spouse Relief? After you have completed the documents and proofs, you may send the documents to the Internal Revenue Service. You may also fax the Form 8857 and other documents to the IRS at 1-855-233-8558. It’s best to include your Social Security Number and name on any documents or files you send to the IRS. When is Form 8857 Not Required? You’ve already come to a closing agreement with the IRS for the same tax liability you are requesting a relief for. The court did not review whether to give you relief from the joint tax liability or not. On the other hand, you did not ask for relief. IRS.The final court decision refused to give you relief.